So-yeon (Park Min-young) is an animal groomer who works in a pet shop. One day, she gets stuck with a Persian cat named Silky when its owner suddenly dies. From that moment on, Soyeon is constantly haunted by a bob-haired girl with green, cat-like eyes who sends her life into disarray. So-yeon desperately seeks help from her friends and family but no one will listen. 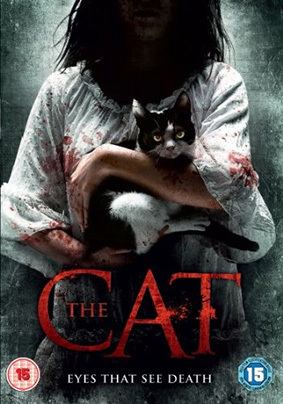 The Cat is the latest ghostly horror to reach the UK from South Korea, and is described in the press notes as "a must for fans of the Whispering Corridors series, as well as the supernatural chillers of Japanese director Hideo Nakata (The Ring, Dark Water)." Just one thing, though. We can't help suspecting that The Cat is not a direct translation of the original Korean title, which is the slightly less compact Go-hyang-i: Jook-eum-eul Bo-neun Doo Gae-eui Noon. English language reviews are a little thin on the ground at present, and most seem to suggest the film is peppered with horror clichés, but BeyondHollywood.com had this to say of the film: "whilst by no means outstanding, The Cat is a perfectly solid and entertaining piece of Korean horror, and one which should go down well with genre fans." We shall see. The Cat will be released on UK DVD on 30th December 2013 by Matchbox Films at the RRP of £15.99. No extras have been listed.